This is the final installation of our colleague Peter Cook’s four-part series on the education reform process in the Jefferson Parish Public School System in Louisiana. Click here for Part I, Part II, or Part III. Establishment of long-term structures, systems and processes needed to sustain school improvement. Conducting a diagnostic assessment was a critical first step in planning the broader district-wide reorganization effort. The diagnostic assessment examined the district’s departments, systems, and processes to identify gaps and areas-for-improvement in the JPPSS’ management and support structure. The assessment process first involved a thorough analysis of district data, including school performance indicators, central office staff allocations, and a breakdown of the budget. While the data analysis provided a good high-level snapshot, we also conducted in-depth interviews with 36 senior and mid-level central officials to gain a more comprehensive, nuanced understanding of JPPSS’ operations and culture. Right-size the Organization: Responsibilities at the central often overlapped with the result that departments managed programs outside of their intended focus areas, while others spent considerable time and resources on non-essential responsibilities. Provide Greater Support to Schools & Students: Multiple departments were providing professional development for schools, but these efforts were fragmented and interviews indicated an overall lack of communication and collaboration among support staff. In addition, performance data indicated the district had not been meeting the needs of its most challenged and high-risk students. Focus on Data-Driven Strategies & Innovation: Departments and their staff members were not driving toward specific, measureable goals based on data and tied to broader district and state goals. Resources were directed to ineffective programs because there was no accountability for results. In interviews, staff often struggled to articulate and connect how their work impacted schools. Transition from HR to Human Capital: It was clear that many problems stemmed from outdated and inefficient human resources practices. The district lacked a strong talent pipeline, and disciplinary and grievance procedures drained significant attention from Human Resources’ core responsibilities. Ensure Efficient Operational and Financial Oversight: Previous audits of the district’s finances voiced concern that the oversight of various funds was distributed over several different departments. Furthermore, interviewees voiced a nearly universal frustration with the district’s current technology management system. After considering the findings of the diagnostic assessment, we conducted a survey of the structures and strategies being used in other urban school districts to inform JPPSS’ reorganization plan. In particular, we drew upon research from the Center on Reinventing Public Education at the University of Washington, the leading organization in district portfolio management research, for ideas that could be adapted to the Jefferson Parish context. Guided by the findings from the diagnostic assessment, as well as the strategies identified in the benchmarking survey, we developed a reorganization plan that recommended the closure, consolidation, and creation of several central office departments; proposed changes to delivery of various programs and services; and, recommended various changes in personnel. Finally, in light of a projected SY 2012-13 budget deficit, we conducted an analysis of the projected cost savings created as a result of the central office reorganization. While an initial draft was presented to key members of Superintendent Meza’s leadership team for feedback, we turned our attention to district policies and regulations to align them with the changes incorporated in the reorganization plan. Toward this end, we created new organizational charts for each unit in the central office and updated job descriptions for all senior leadership positions. We also provided the Superintendent with an analysis of the board’s HR policies and recommended a series revisions to bring them into compliance with the significant changes passed by the Louisiana Legislature in Act 1 and Act 54. 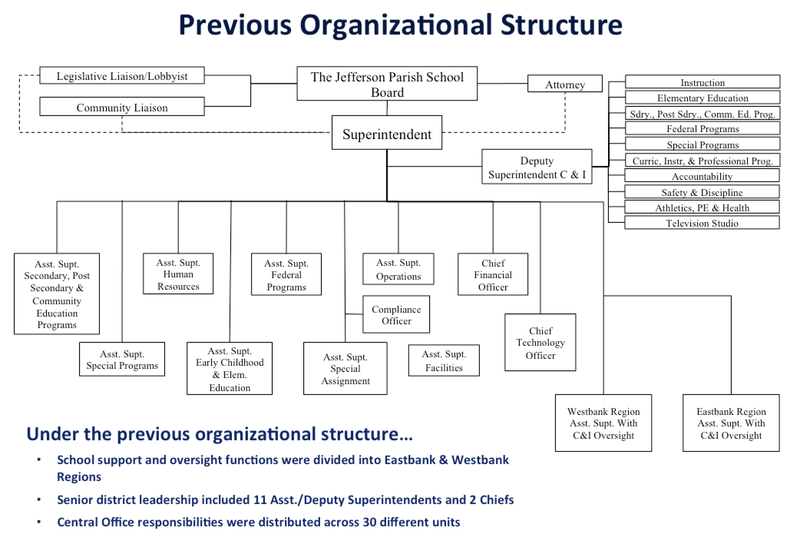 When the reorganization plan was presented to the Jefferson Parish School Board in April 2012, it passed unanimously and thereafter the focus of MIE’s work shifted from planning to implementation. Superintendent Meza’s intention to shift a greater share of district resources to schools was reflected in the decentralized and streamlined central office structure delineated in the reorganization plan. This required a reduction in the number of positions in the central office, as resources were reallocated to schools. Mass Insight helped the district facilitate this process. Finally, we planned and executed the recruitment and selection process to staff the district’s five Network Support Teams (NSTs). As part of the reorganization process, the district’s 80+ campuses were organized into five networks with the aim of providing a more responsive and integrated system of support for schools. Each network has its own NST, led by a Network Executive Director and composed of a cross-functional team of School Support Specialists who are directly accountable for the performance of the schools under their purview. While the type and intensity of this assistance varies according to the needs of the schools in each network, the work of the NSTs ultimately seeks to build the capacity of school-based staff through ongoing professional development of administrators and teachers. In the course of just over two years, the Jefferson Parish Public School System implemented a series of bold reforms that reoriented the district around the needs of schools and their students and established JPPSS as the most progressive and innovative school district in Louisiana. 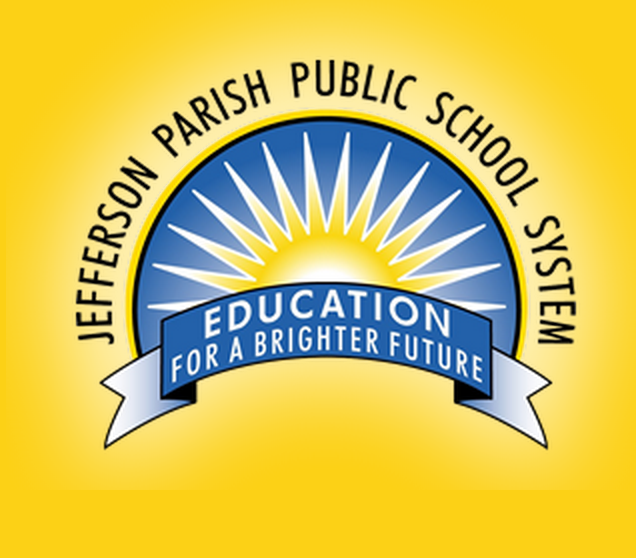 These changes have put JPPSS on a new trajectory, and while Jefferson Parish certainly still has room to improve, overall academic performance in the district has steadily improved. 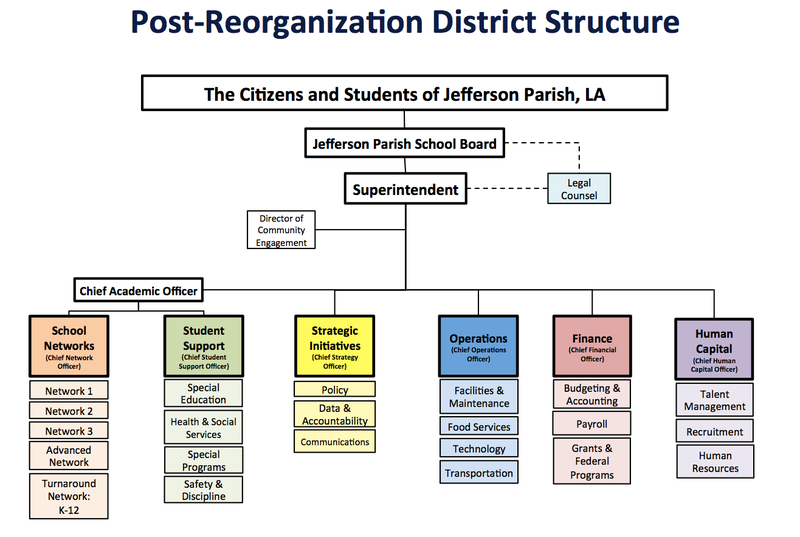 The transformation of JPPSS is also a powerful illustration of the ability of school districts – even large school districts – to “reform from within.” As Jefferson Parish’s experience shows, it requires a broad base of support in the community for change, a leader focused on the needs of students, and a strategy to reorient the organizational structure and culture on the district’s educational mission. You can learn more about Mass Insight’s work to improve low-performing schools across the country at massinsight.org.